← Welcome to our New Web Site ! Revell Germany has re-released their 1/144 scale Airbus A.330-300 kit with the very colourful Thai Airways markings as RV4870. This release comes with PW4000 engines. Thai’s A.330-300 fleet are fitted with PW4000 engines for the first 12 aircraft (HS-TEA – H, TEJ – M), and the rest of the fleet are powered by RR Trent engines. Nazca did a good job of de signing the decal, with lots of small detail decals included. The Italian printer (probably Cartograf) did an excellent job of printing it. A few niggling detail errors though. Glaring is the omission of the large gold logo that (for about the last 6 years) almost completely covers the forward cabin door on both sides of the aircraft. Secondly, the registrations for the PW powered A.330’s are in the HS-TE series. The decal requires the modeler to piece it together HS-T, E and the last letter. Third, the aircraft names *: 10 ship names are provided in English (for the Port side), 9 in Thai (for the Starboard side). Some of the aircraft names are mis-spelled – “Sri Sakhon” (TEB) should be “Si Sakhon”, “Bang Rajan” (TEC) should be “Bang Rachan”, “Srichulalak” (TEK) should be “Srichulak”, and the name for TEK in Thai is missing. While HS-TEL and ‘TEM are PW4000 powered, they cannot be modelled as neither the “L” nor “M” are provided, nor the ship names. * Ship names were confirmed on Planespotters.Net and cross checked with the Thai Civil Aircraft Register. 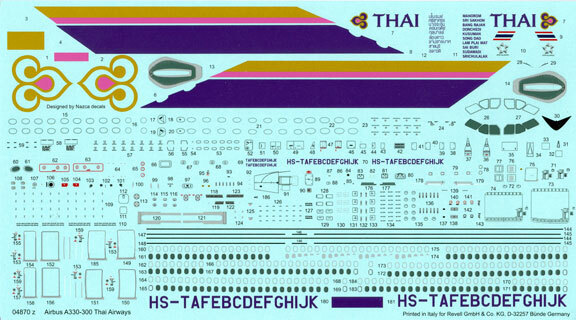 This entry was posted in New Kits and tagged A.330-300, Airbus, Revell Germany, Thai Airways. Bookmark the permalink.